The General Market is centrally located in its own square off Market Street, next to the ancient landmark of All Hallows parish church. New traders can apply for 3 months free rent (to be taken in a pattern agreed with the Town Centre Charge hand) and can apply for casual status and trade on a daily licence - no deposit, no long term commitment, no hassle. As a twenty first century market town and proud of the fact that many traders have enjoyed a long association with Wellingborough market - some families have traded here for over sixty years – we are looking to strengthen the range of products and services on offer to our customers. 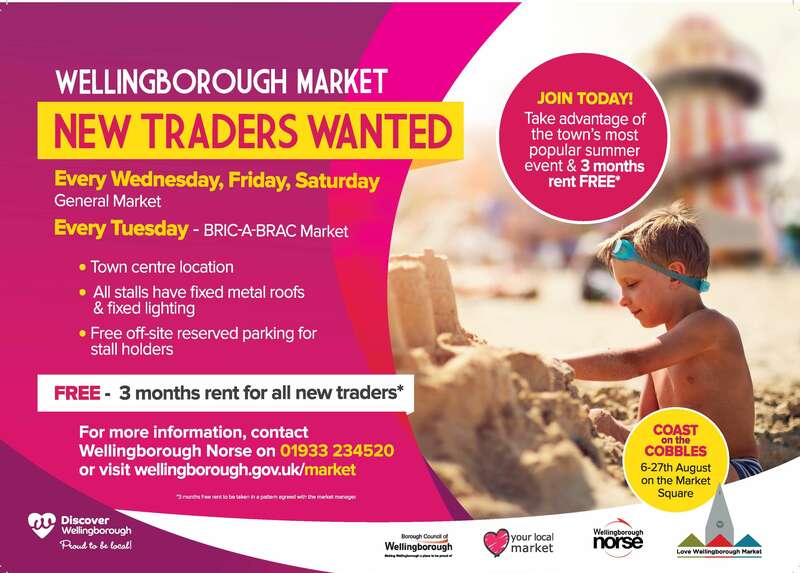 Wellingborough Market could be the opportunity you are looking for! Traders packs are available to download. FREE parking for traders is available in the nearby car park in Jackson's Lane and an additional parking at the Swansgate Centre for the public. The town centre enjoys good public transport links.